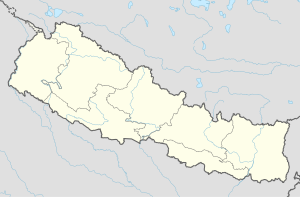 Gandakot is a town in Rampur Municipality in Palpa District in the Lumbini Zone of southern Nepal. The municipality was established on 18 May 2014 by merging the existing Gadakot, Gegha, Khaliban, Darchha village development committee. At the time of the 1991 Nepal census it had a population of 4965 people living in 898 individual households. ^ "72 new municipalities announced". My Republica.com. Archived from the original on 2014-06-18. Retrieved 2014-06-10. ^ "Government announces 72 new municipalities". The Kathmandu Post. Retrieved 2014-06-10. ^ "Nepal Census 2001". Nepal's Village Development Committees. Digital Himalaya. Archived from the original on 12 October 2008. Retrieved 12 December 2008. This Lumbini Zone location article is a stub. You can help Wikipedia by expanding it. This page was last edited on 15 June 2017, at 13:40 (UTC).